Today's post covers that lurking danger for vintage and star player collectors alike: counterfeits. Those bits of paper and ink that pretend to be more than they really are. Artifacts of a hobby that, too often, turns out to be more of a cheap hustle than someone's true love of the game. This blog's covered a few of them, most recently this 1971 Bazooka Carl Yastrzemski, but another worth talking about recently came across my desk. August 3 marked the start of 2011's National Sports Card Convention in Chicago and we can assume dozens (if not hundreds) of misidentified reprints litter the show floor, given the market for rare cards and vagaries of collector or dealer knowledge. 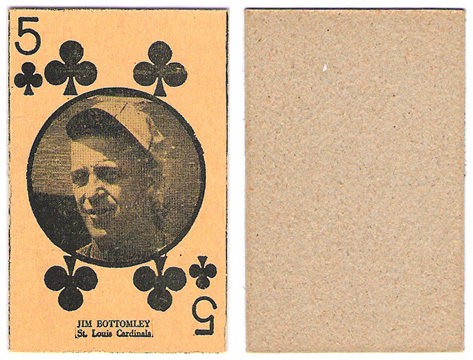 Just this week, a fellow trader asked me to evaluate this purported W560 strip card of HOFer Jim Bottomley. His question: is it real or fake? If the latter, what should he look for to avoid bad ones in the future? 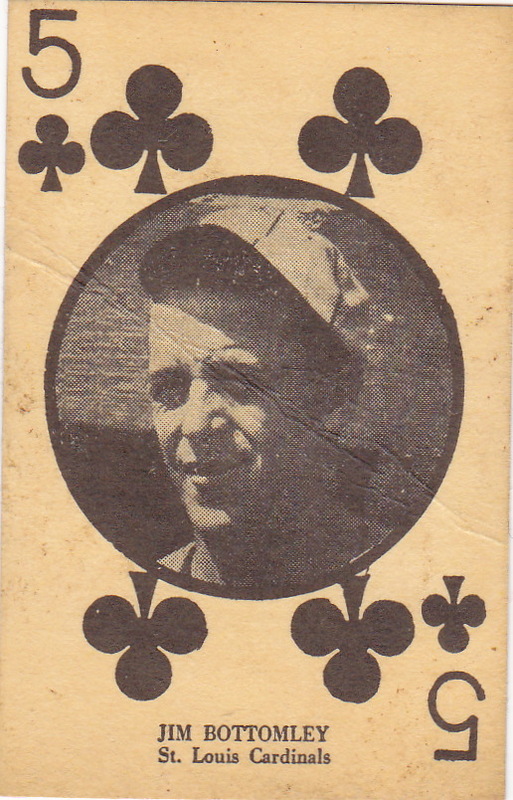 Covering a little of the set's history will help understand how to distinguish them, so let's cast back to the 1920s, when cheaply printed cards like these W560s made up most of the market. 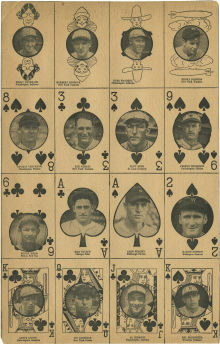 For this set, originals came on 4-by-4 sheets (and possibly 4-card strips), demarcated by solid black lines. Paper stock first made me suspect my friend's W560 as fake, since a real card's actually two layers, with thin bleached paper affixed to a cardboard backing. Note this authentic scan's difference in tone and texture, where his was a matching off-white on both sides. Kids cutting players off 4-by-4 blocks left black border remnants on most authentic cards. My scanned reprint's close to proper size, but there's no black edge to indicate it once had neighbors on a sheet. Sizes did vary in the 1920s, so provides supporting evidence more than certainty; the single-tone paper stock already convinced me it wasn't kosher. Conversations about counterfeits should include grading services and their role in assurance of authenticity. Most provide high reliability, but graders remain human and limited by available research on a set, player, or rare variation. 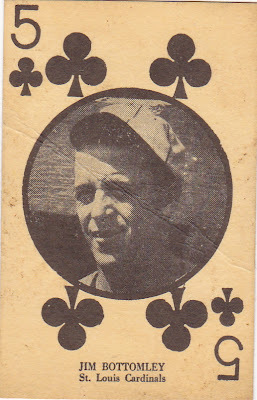 Those who know printing techniques, available paper stocks, baseball business history, and pre-Internet reprints (late 60s to early 90s) should outperform others who just compare cards to other cards. Lest we forget about W560s themselves, Jim Bottomley's just one of many HOFers in this set. All-timer Rogers Hornsby even helped date the set's release, as it shows him with the Cubs, a team he joined in 1929. (Some catalogs list them from 1927, when he would've been a Giant or Cardinal.) The base design comes in a few colors, including red and black, as shown in this post. A two-tone version also exists, but probably represents an earlier, related issue. See this W560 Network54 forum discussion for more details and scans. UPDATE: This Luke Sewell 5 of Hearts shows the odd edges and border remnants you'd expect from an original W560 strip card. Value: Low-grade, lesser-known W560s ball players go for $10-20, depending on level of wear. HOFs can cost several times that. Fakes / reprints: You've seen at least one of the reprints and I bet there's plenty more. 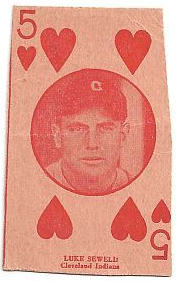 Any set with lots of early HOFers risks the attention of counterfeiters.